WEST WINDSOR – It has been 10 years since a program dedicated to choral music debuted on WWFM The Classical Network, located on the West Windsor Campus of Mercer County Community College (MCCC). While Dr. Marjorie Herman, program host for “Sounds Choral” says it seems like just yesterday, she says it has been a labor of love that has been well worth the effort. On May 3, WWFM will celebrate the 10th anniversary of “Sounds Choral” with a special live, two-hour program beginning at 1 p.m. For the past decade the nationally-syndicated program, originating from the MCCC campus, has presented a body of music that explores themes that spotlight either a composer or ensemble, past or present. The program can take on a seasonal theme, and at times focuses on an idea that unites many styles, periods, and forms. “It is this power of the choral sound, whether in a motet of Brahms or a spiritual arranged by Moses Hogan, which serves as the nexus of the program,” Herman said. Interviews with prominent or up and coming conductors and composers have rounded out the scope of the program, such as Dale Warland, founder of the Grammy-nominated Dale Warland Singers and renowned champion of contemporary choral composers. Warland is one of only two choral conductors inducted into the American Classical Music Hall of Fame. 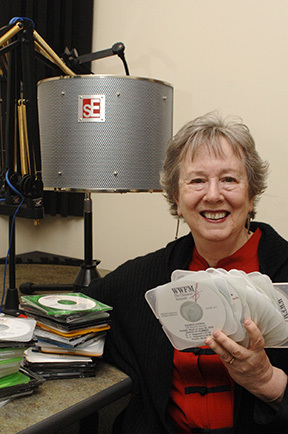 Dr. Marjorie Herman, host of WWFM's "Sounds Choral," with some of the 10-years worth of program recordings. The “Sounds Choral” 10th Anniversary Celebration on May 3 will feature James Jordan, Senior Professor at Westminster Choir College and noted author, as co-host. Jordan and Herman will share excerpts from several programs centering on pivotal musical events at Westminster, which will include special guests Ryan Brandau, Artistic Director of Princeton Pro Musica; Fernando Malvar-Ruiz, Litton-Lodal Music Director of the American Boychoir; Lynnel Jenkins, Artistic Director of the Princeton Girlchoir; and Craig Hella Johnson, founder of the noted ensemble, Conspirare from Austin, Texas. Herman received the Doctor of Music degree in Choral Conducting from Indiana University, Bloomington, Ind., and has taught at the university and community levels for many years. Currently the music director for the Unitarian-Universalist Congregation of Princeton, she has served on the conducting/teaching faculties of the University of Pittsburgh, the University of Maryland/Baltimore County, and on the graduate faculty of Georgian Court University. The “Sounds Choral” 10th Anniversary Celebration will be broadcast May 3, live, at 1 p.m. on WWFM The Classical Network. Located on MCCC’s West Windsor Campus, WWFM is New Jersey’s only 24-hour classical music station. The station can be heard at 89.1 FM throughout Central New Jersey, in Philadelphia on 89.5 HD2, in New York on 89.9 HD2, and streaming live at wwfm.org. Radio frequencies for your listening area can be found at wwfm.org.